This is the third page of Shinpan kaisei, Kosen nedantsuke, Narabi ni bantsuki (Improved New Edition: Price List of Old Coins, Together with Rarity Ranking), printed in the city of Nagoya in 1799. This book belongs to the collector Sam Leung who kindly provided me with the images and allowed me to present these at my site here. 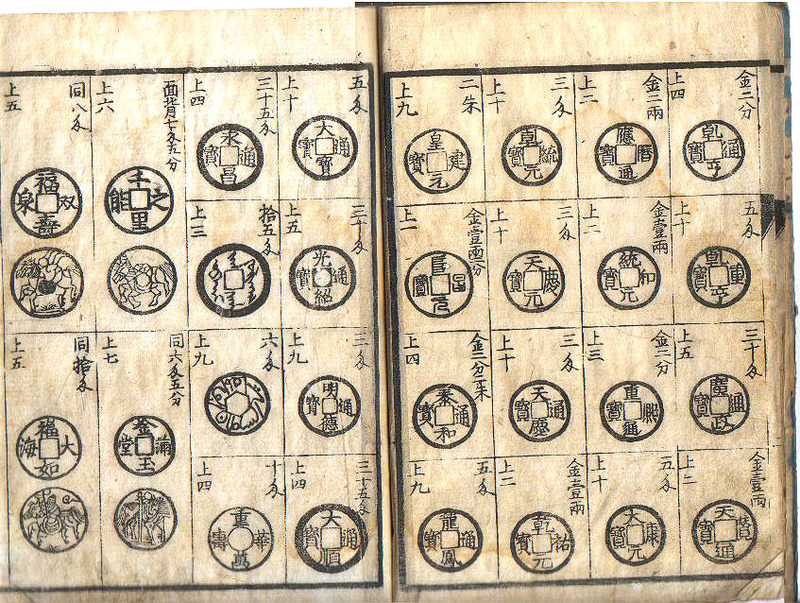 The coins are mostly from dynasties with seats within the boundaries of modern China, but note the coin in row 6 which has a six sided inner hole. This is a 16th century Bantam coin from Java and the writing is in Arabic. The coin above the Bantam coin has writing in Manchurian and is the one made by the Manchu founder of the Qing dynasty, Nurhachi, in 1616. The last two rows are of charms rather than coins. They purport to show the front and the back of the charms, but if you think about the images something is strange. The fronts all show square holes but the backs show round holes or no holes at all. Yes... You are entering the Twighlight Zone!